Delta Vacations gives you more ways to rack up miles, and earn toward your Medallion® Status. SkyMiles® Members earn 1,500 bonus miles per person, in addition to credited flight miles, with a flight and Bronze Preferred Pick hotel package. 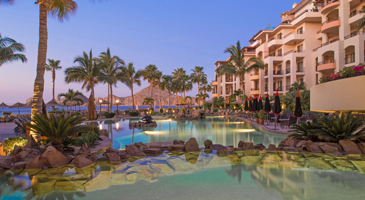 *Sample Pricing: This offer is available from hundreds of origin cities, but this price, which reflects the offer, is based on travel between Atlanta and Los Cabos, staying at Villa del Palmar Beach Resort & Spa. Price is per person, based on double occupancy and select Monday departures and Saturday returns, July 15 – 20, 2019, and is subject to change. Additional restrictions and baggage charges may apply. See Terms and Conditions for details. 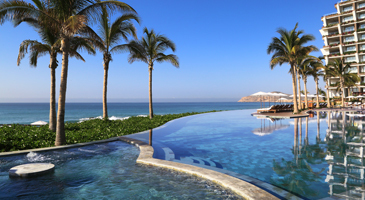 Perfectly set on the hillside overlooking the Pacific Ocean and the Sea of Cortez, this unique property offers a wide array of delicious culinary options, three free-form pools and the relaxing spa treatments of Spa Sandos. Consider the Finisterra Suites section, which boasts spectacular views over the bay and the marina. Facing the crystalline waters of the Sea of Cortez and seated on golden sand beaches, you will be pampered in exceptionally spacious all ocean view suites. With luxurious and over the top experiences of land and sea, Grand Velas Los Cabos is a refuge on the southern tip of the Baja Peninsula, where desert meets the ocean in a vibrant paradise. 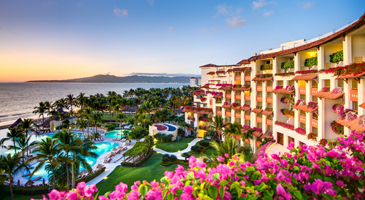 Experience the vibrancy and beauty of the Puerto Vallarta coast, in one of Mexico's most spirit awakening destinations. 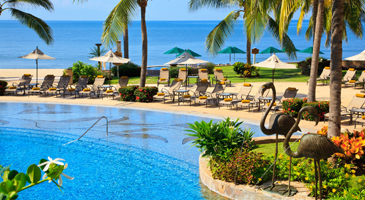 Situated on the glistening waters of Banderas Bay in beautiful Nuevo Vallarta, Mexico, Velas Resorts soothes the soul, channeling the spirit of the sun-kissed coastline. In Cabo San Lucas, dramatic landscapes await, where the crystal waters of the Sea of Cortez meet the turquoise waves of the Pacific. Guests staying at the Villa Group Resorts in Cabo can find pleasure for the senses with gourmet cuisine, an aromatherapy massage at the Desert Spa and the sophisticated comfort of only the best suites. Puerto Vallarta and Riviera Nayarit will seduce you with scenery, intrigue you with history, and tease you with flavor. Enjoy days spent snorkeling, surfing, scuba diving or just lounging poolside, while your nights are devoted to sitting on your private villa balcony. 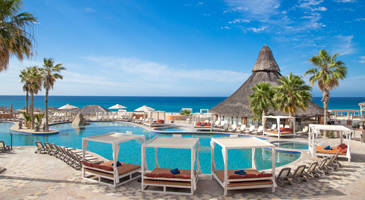 *Price is per person, based on double occupancy at Villa del Palmar Beach Resort & Spa, between Atlanta and Los Cabos. Monday departures and Saturday returns via nonstop service on Delta and certain Delta codeshare partners, and is valid for specific travel dates July 15 – 20, 2019. Advance purchase requirements vary. Other travel days and dates and accommodations are available at other prices. May require travel on specific flights or times; blackout dates may apply. For travel between North America (U.S. and Canada) and Mexico ticketed prior to September 19, 2018, $25 USD/CAD for 1 checked bag and $55 USD/CAD for second checked bag. For travel between North America (U.S. and Canada) and Mexico ticketed on or after September 19, 2018, $30 USD fee for 1 checked bag and $55 USD fee for second checked bag. Allowances are subject to size/weight limits. Contact a Delta agent or see Excess Baggage for details. Purchase any Delta Vacations flight and hotel package from any Delta Vacations origin in the U.S. or Canada to Los Cabos, Puerto Vallarta or Riviera Maya, April 1 – 30, 2019, for travel April 1 – December 31, 2019. Participating hotels include: Mexico: Los Cabos — Grand Velas Los Cabos, Sandos Finisterra Los Cabos, Villa del Arco Beach Resort & Spa, Villa del Palmar Beach Resort & Spa and Villa La Estancia Beach Resort & Spa; Puerto Vallarta — Casa Velas Hotel Boutique and Villa del Palmar Beach Resort & Spa Puerto Vallarta; Riviera Nayarit — Grand Velas Riviera Nayarit, Villa del Palmar Flamingos Beach Resort & Spa Riviera Nayarit and Villa La Estancia Beach Resort & Spa Riviera Nayarit. To receive the highest discount, travel May 5 – December 20, 2019. To receive the highest discount, travel April 14 – 25 or May 20 – June 21, 2019.
Credit is per adult, per night. One hydrotherapy circuit per person, per stay (limited to 2 adults). Book by April 30, 2019, for travel through January 6, 2020. To receive the highest discount, travel April 1 – December 18, 2019. Book a Master Suite Plus room for the price of a Master Suite. Spa credit is not accumulative, redeemable or transferable. Spa credit valid for treatments of 50+ minutes only. Spa credit has no cash or commercial value, and cannot be modified or combined with any other hotel credit. Spa credit does not apply to hydrotherapy services, beauty salon or boutique. Golf cart not included for unlimited golf; a mandatory per person charge will apply. City and Shopping Tour departs from Velas Vallarta City, and runs on Monday & Tuesday. Cultural & Tequila Tour runs on Wednesday & Thursday. Subject to availability and reservations. All tours subject to change. Boutique discount not combinable with any other hotel-provided promotion, discounts or programs. Schedule for dinner at Grand Velas Riviera Nayarit is pre-set for 6:00 p.m.; transportation to and from Casa Velas to Grand Velas Riviera Nayarit included: departure at 5:30 p.m. and return service at 8:00 p.m. Additional taxi service charge applies for guests who do not take transportation at these times. The dinner is cumulative with a 5-night or longer stay at Grand Velas Riviera Nayarit. Dinner reservations are subject to availability. Guests staying in Wellness Suites receive one relaxing massage on their suite terrace, per person, per stay; one hydrotherapy circuit at the spa, per person, per stay; and the assistance of a Wellness Concierge. Book by April 30, 2019, for travel through December 18, 2019. To receive the highest discount, travel April 7 – April 30 or July 7 – August 11, 2019. Up to two kids or teens stay free when travelling with two adults. Spa credit is per adult, per night. Spa credit is valid for treatments over 50 minutes, and is not valid for salon services or spa products. Spa credits are noncumulative, nonrefundable, nontransferable and not redeemable for cash, room nights or any other item; are not combinable with any other hotel-provided promotions, discounts or programs; and cannot be saved for future stays if unused. Redeemable only at Vista Vallarta or Marina Vallarta Golf Courses. Reservations are required, and must be requested with concierge. Transportation to and from golf course is not included, nor golf clubs rental, cart fee or caddie services. The discounts are noncumulative, nonrefundable, nontransferable and not redeemable for cash, room nights or any other item; are not combinable with any other hotel-provided promotions, discounts or programs; and cannot be saved for future stays if unused. Spa credit is per adult or teenager (up to 2 teenagers), per night. One kid stays and eats free for every paying adult on the All-Inclusive Plan. Kids eat free from the kids menu when an adult meal is purchased on the European Plan. Book by April 30, 2019, for travel through January 2, 2020. Kids 12 years old and younger stay and eat free when travelling with two adults and staying in the All-Inclusive Plan April 28 - December 28, 2019. Kids 15 years old and younger stay and eat free when travelling with two adults and staying in the European Plan April 28 - December 28, 2019. Book by April 30, 2019, for travel through December 28, 2019.